Good back exercises are hard to come by outside the gym, but these 5 exercises will help keep you and your back, back on track. Doing these 5 back exercises regularly will help your back to stay young and healthy for years to come. Swimming on the exercise mat is a great way to strengthen the spinal erectors, or the muscles that run up and down our spine to help strengthen and support it. When doing this exercise it's important to keep your torso still as you just extend or lengthen your opposite arm and leg. Keep your torso still by gently pressing your pubic bone in to the mat, hollowing the pelvis. Do this for 3-4 full breath cycles working as quickly or slowly as you can keep the torso still. 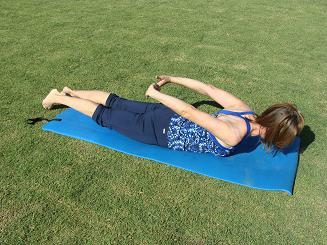 Back extension exercises such as the cobra, shown here are important for opening the vertebra in the spine. It is one of the good back exercises because it works to strengthen the back by the pulling the abs in deeply while opening the vertebra in the front of the spine. 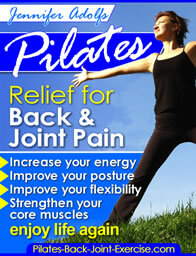 This one just feels great to stretch the back and abdomen. Inhale as you press into your hands peeling your spine up off the mat and then exhale as you lengthen out and back down. Back flexion exercises are important to stretch and open the vertebrae of the back of the spine. The exercise shown is the Spine Stretch forward over the exercise ball. Inhale to begin sitting tall and then exhale as you draw your abs in stretching forward over the ball. Inhale to press into the ball and peel or stack your spine back up tall. As far as good back exercises go, this one is my favorite. It feels great, especially after working on the computer for hours. Begin this upper back stretch lying flat on your stomach with your arms clasped high on your back. Inhale to lift the head and chest off the mat reaching your hands up off your back and down to the end of the mat at the same time. Exhale to slowly lower your body bringing your hands high on your back again. When you think of doing good back exercises you should always include those that help with your balance. This kneeling four point balance exercise is especially good because it works against gravity in this belly down position and involves lifting one arm and leg off the mat. Begin kneeling on all fours in neutral. As you inhale extend one leg and when stable extend the opposite arm as well. Hold and then release down and switch. Repeat to each side for 4-6 repetitions. See more good back exercises to help with your strength and flexibility here.